Luke James scored his first goal in the league since joining Peterborough United last summer. 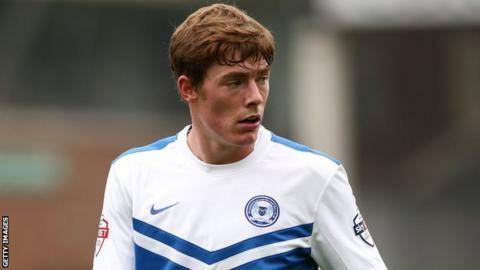 Peterborough United made it four consecutive wins under Dave Robertson as they kept their play-off hopes alive with a win against Doncaster Rovers. The visitors broke the deadlock when Luke James latched onto Jon Taylor's cross with a superb diving header. Joe Newell could have put Posh two up but his long-range strike was well tipped over the bar by Stephen Bywater. Peterborough doubled their lead late on when they broke from a Doncaster corner and Conor Washington fired home. "We didn't deserve anything out of the game, the better team won sometimes you have to hold your hands up. "We knew it was going to be tough and it was. "Both their goals have come from mistakes, which isn't on. We shouldn't have let them break from a corner, at 1-0 we always had a chance but letting them break and get a second killed the game." "That was a very, very tough game, Doncaster are an excellent footballing team, and we knew we'd have to be dogged and work for each other. "We knew our width would cause problems against their diamond though, and as it materialised we had 14 crosses in the first half. "We knew they'd change their shape and have a go at us in the second half but I have to say the boys were magnificent. "Our goalkeeper has been outstanding for us, he's an absolute competitor, and the save he made at 1-0 was the big moment of the game." Match ends, Doncaster Rovers 0, Peterborough United 2. Second Half ends, Doncaster Rovers 0, Peterborough United 2. Attempt missed. Abdul Razak (Doncaster Rovers) right footed shot from outside the box is too high. Substitution, Peterborough United. Shaun Brisley replaces Kgosi Ntlhe. Goal! Doncaster Rovers 0, Peterborough United 2. Conor Washington (Peterborough United) right footed shot from the centre of the box to the bottom right corner. Assisted by Kyle Vassell. Attempt saved. Curtis Main (Doncaster Rovers) right footed shot from the centre of the box is saved in the top centre of the goal. Corner, Doncaster Rovers. Conceded by Gabriel Zakuani. Attempt blocked. Theo Robinson (Doncaster Rovers) left footed shot from the right side of the box is blocked. Substitution, Peterborough United. Kyle Vassell replaces Luke James. Substitution, Doncaster Rovers. Abdul Razak replaces Dean Furman. Jonson Clarke-Harris (Doncaster Rovers) wins a free kick on the left wing. Ricardo Santos (Peterborough United) wins a free kick in the defensive half. Substitution, Peterborough United. Harry Anderson replaces Joe Newell. Attempt missed. Kyle Bennett (Doncaster Rovers) right footed shot from the right side of the box is just a bit too high. Substitution, Doncaster Rovers. Theo Robinson replaces Nathan Tyson. Kyle Bennett (Doncaster Rovers) wins a free kick in the attacking half. Attempt saved. Joe Newell (Peterborough United) left footed shot from the left side of the box is saved in the centre of the goal. Delay in match Luke James (Peterborough United) because of an injury. Substitution, Doncaster Rovers. Kyle Bennett replaces Harry Forrester. Corner, Peterborough United. Conceded by Dean Furman. Kgosi Ntlhe (Peterborough United) wins a free kick in the attacking half. Foul by Jonson Clarke-Harris (Doncaster Rovers). Curtis Main (Doncaster Rovers) wins a free kick on the left wing. Conor Washington (Peterborough United) is shown the yellow card. Kgosi Ntlhe (Peterborough United) has gone down, but that's a dive. Corner, Doncaster Rovers. Conceded by Joe Newell. Corner, Peterborough United. Conceded by Stephen Bywater. Attempt saved. Luke James (Peterborough United) right footed shot from the right side of the box is saved in the bottom right corner. Jonson Clarke-Harris (Doncaster Rovers) wins a free kick in the defensive half.